Your check-in is after 4pm, but is not guaranteed. At any time after 4pm, you may go straight to your unit, punch in the lock box code given to you, and enter your vacation rental property. There will be extra keys in the unit on the counter. We cannot guarantee an early check-in however we will take efforts to accommodate an early check-in whenever possible. Please notify our office in advance of your estimated arrival time so we can note your reservation and work toward approving an early arrival time. By occupying the condo prior to the check-in time or approved early check-in time, you accept responsibility of any maintenance, cleanliness, damages, etc. concerns that linger from the previous guests. Check out is promptly at 10am. If you would like to extend your stay, please notify our office at least 24 hours prior to your departure and we will do all we can to accommodate you if your present accommodations are available. Please be sure to return all keys and linens to the condo before departure. Booking will not be confirmed until receipt of Rent Deposit (or full rent amount plus linen/cleaning fee and security deposit if reservation made within 60 days of arrival for reservations less than 27 nights). If paying by check, we must receive check within 48 hours of booking. Your reservation will not be confirmed until check is received. Security Deposit checks are due on the same date as final payment is due (or at booking if making reservation within 60 days of arrival date). We will hold reservations with a credit card for up to 48 hours. Booking will not be confirmed until receipt of your signed Reservation Booking Form and Rent Deposit (or full rent amount plus linen/cleaning fee and security deposit if reservation made within 120 days of arrival). If paying by credit card, your card will be charged once signed Reservation Booking Form is received. If paying by check, we must receive check within 48 hours of booking. Your reservation will not be confirmed until check is received. Security Deposit checks are due on the same date as final payment is due (or at booking if making reservation within 120 days of arrival date). Receipt of your emailed confirmation notice indicates acceptance of your reservation and all the terms and conditions contained herein. Should it be necessary, Resort Harbour Properties, LLC (“RHP”) reserves the right, in its sole discretion, to adjust or cancel any confirmed reservation or to provide alternate accommodations. Rent Deposit Due at Booking - 20% of rent subtotal amount (including tax) is due at time of booking. If reservation is made within 60 days of your planned arrival date for reservations less than 27 nights or 120 days of your planned arrival date for reservations 27 nights or greater then total rent amount, including cleaning/linen fee, processing fee and security deposit check, will be due in full at time of booking. Total Balance Due - Remainder of rent balance, including tax, plus cleaning/linen fee, Processing Fee and Security Deposit check, is due 60 days prior to arrival for reservations less than 27 nights and is due 120 day prior to arrival for reservations 27 night or greater. Payment schedule will vary with annual lease. Total Balance Due Payment will be processed on the Due Date automatically by Resort Harbour Properties to the credit card on file unless different instructions are submitted prior to the Due Date. Failure to make any payments in a timely manner may result in the cancelation of your reservation and forfeiture of any funds. A $200.00 refundable security deposit is due in the form of a check on the same date your remaining rent balance is due when paying by check or if the reservation extends greater than 27 days (not included in the total amount due). It will be refunded after departure and inspection of your rental unit. If the staff of Resort Harbour Properties, LLC determines, in its sole discretion, that is excessive dirt, furniture/carpet stains, or other damage present, additional charges will be assessed and deducted from Deposit and/or charged in addition to the Deposit. Guests paying by credit card are not required to submit a security deposit in the form of a check unless the reservation extends greater than 27 days however acknowledge that their credit card on file will be charged for any expenses Resort Harbour Properties, LLC determines, in its sole discretion, that is excessive dirt, furniture/carpet stains, or other damage present, additional charges will be assessed and charged to your credit card for the full amount. Cancelation during any time will result in a $65.00 fee for any reservation less than 27 night stay and $130.00 fee for any reservation 27 nights or greater. If cancelation occurs before final payment, then you will be refunded your initial rent deposit (20% of total rent). Cancelation after final payment will result in a 100% loss of rent monies paid (excluding Security Deposit and Cleaning/Linen Fee). No refunds will be given for reservations booked within 60 days prior to arrival for reservations less than 27 nights or 120 days for reservations greater than 27 nights. The cleaning/linen fee and Security Deposit will be refunded at any time of cancelation however the Processing Fee will not be refunded. Travel Insurance is highly recommended to avoid a 100% loss of monies paid, should you need to cancel before arrival. The cost of Travel Insurance is approximately 7.65% of your total rent amount. Please contact our office if you would like to purchase a Travel Insurance package and we will be happy to assist you. (Certain deadlines and/or restrictions apply). Although there are many things we can control, there are those rare unforeseen events beyond our control that may result in a change of plans, (i.e. hurricanes, maintenance issues, construction, etc.). Because of this, your confirmed unit may no longer be available. No refunds will be given for unforeseen circumstances and we highly recommend purchasing Travel Insurance to accommodate you in these rare conditions. A linen/cleaning fee is due with your Total Rent Balance Due. This fee will take care of your departure cleaning and also provide your unit with bath and kitchen towels, clean sheets on every bed, toiletry, laundry and cleaning amenities. Reservations exceeding 27 nights require a mid-stay cleaning every 2 weeks of stay and there after every 2 weeks per reservation stay. If for any reason you should require extra linens/towels, we can provide them to you for an additional cost. A $35.00 processing fee is due with your Deposit Due at Booking or Total Rent Balance Due date. This fee will not be refunded in the event of a cancellation. In the event it becomes necessary in its opinion, RHP reserves the right to substitute your accommodations. We cannot guarantee the confirmed rate in these instances. New accommodations and rate adjustments will be subject to your approval. Although we will do our best to make your vacation experience a pleasant one, neither RHP nor the owner of the rental unit are liable for the inconveniences in this rare occasion. RHP does not allow house parties in any rental property. Guests are not allowed to organize graduations, proms, gatherings, reunions, weddings, receptions or any other function similar in nature. The maximum occupancy of 6 will be enforced at all times, unless specific rental units allow for additional persons. If at any time an issue of noise arrives and the cause is to be discovered to be a breach of this term RHP reserves the right to assess fees accordingly. Management or owner is not responsible for lost/damaged valuables. If you need any maintenance in your rental unit, please contact our office at 239-590-9127 in a timely manner and we will execute the necessary repairs as quickly as possible. Upon notice from Guest, Resort Harbour Properties will diligently attempt to repair any malfunctioning equipment within the rental property. Guest agrees to report any problems to Resort Harbour Properties as soon as possible after discovery. An outside vendor may be needed to determine the need to repair and/or replace equipment. Should an outside vendor determine the malfunctioning equipment is due to guest neglect, misuse or oversight, the fee for the vendor service call will be charged to the Guest. No refunds will be issued to Guests for any reason due to malfunctioning equipment or misuse. Guest understands that community amenities (tennis courts, swimming pools, etc.) may close for maintenance purposes, and no rent adjustment or refund will be made for circumstances beyond the control of Owner or Resort Harbour Properties. Guest further understands the property owner and/or Resort Harbour Properties is not in control of the community amenities including temperatures on swimming pools/hot tubs/spas. Further, pest control for all rental properties is handled by the community association or a contracted pest control company. Resort Harbour Properties will address any pest control concerns but is not responsible for refunds due to the presence of pests or inconvenience by pest control companies. In the event a significant issue cannot be corrected Resort Harbour Properties will assess the degree of which the guest is inconvenienced and award compensation accordingly. Prior to any credit card dispute, filing of any online review or regulatory complaint the guest agrees to notify Resort Harbour Properties in writing and allow Resort Harbour Properties the opportunity to correct any deficiencies and/or repair any malfunctioning equipment within the rental property. You can file a grievance by emailing [email protected] Please include the reservation number or name on the reservation with the rental property address and detail the issues you are experiencing. In response, we will schedule a time to meet at the property to address any concerns brought forward. We will make every attempt to correct the issue as soon as possible. 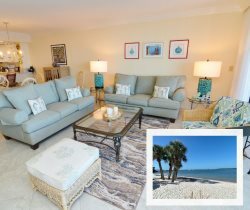 Sanibel Harbour has a no pet policy set forth by the Condominium Association. In addition, Sanibel Harbour holds a no smoking policy for all condominiums on property. Please adhere to these restrictions. Any breech of these policies will result in termination of this agreement, possible eviction from the property, and possible forfeit of any monies paid. Resort Harbour Properties, LLC reserves the right to enter the premises at any time during normal business hours for management of residence or in the case of emergency. If the unit you are vacationing in is currently listed for sale, then RHP may also enter premises to show property with a 24-hour notice. Guests agree to keep the maximum number of people occupying the premises at 6 people or less, as found in the Association Rules & Regulations. Failure to abide by this policy may result in eviction from the property and possible forfeiture of any monies paid. Two parking spaces are allotted for each condo and parking passes will be made available to guests, they will be in the condo upon your arrival. There are some parking restrictions at Sanibel Harbour: RV's, trucks, boat trailers, etc. are not permitted. Only owners are permitted to park under the buildings. All other guests must park in the outdoor parking lot. Spaces are on a first come, first serve basis. If you would like to receive mail during your stay at Sanibel Harbour, please have it sent to you in care of Resort Harbour Properties, LLC at: 17170 Harbour Pointe Dr. #101, Fort Myers, FL 33908, and your mail will be given to you. Please refrain from having mail sent directly to your rental condominium. Resort Harbour Properties shall not be liable to guest or to any other party for damages to property or for the injury to persons upon the premises from any cause whatsoever, including defects in the premises or otherwise. Guest shall release and hold Resort Harbour Properties, LLC harmless from and against all liabilities, claims, expenses, fees, loss of use and actions of any kind that Guest, including his or her children, spouses, relatives, invitees, guests, agents or employees, may have now or at any time in the future arising out of guests’ use and occupancy of premises. Further, Guest shall indemnify and save RHP harmless from any and all claims, demands, suits, or actions of any kind it may occur arising out of or occasioned by Guests’ use and occupancy of the premises. This agreement is subject to the rules and regulations of the subject property Association (a copy will be available in your units’ information binder), of which owner of the rental unit is a member. Guest agrees to adhere to all Association Rules and Regulations. Guests understand that all hotel amenities and/or services are off limits to condominium rental unit guests, excluding: the restaurants and Spa (with purchase of service) unless rented unit maintains a Marriott Membership with the Sanibel Harbour Marriott Resort & Spa which allow for usage of the Marriott Pools, Fitness Center, Workout Classes, and Tennis Facility for a fee. Please contact Resort Harbour Properties for specific amenities you may desire to use. No waiver or any breach of any of the terms of this agreement shall be permitted. Although Resort Harbour Properties works hard to assure accuracy, the information provided online is not guaranteed, and may be subject to errors, omissions change of price, or withdrawal without notice.